A power flush aims to restore systems with circulation and boiler noise problems (caused by sludge and corrosion deposits) to optimum operation. Power flushing removes these deposits and the problems that they cause. Existing debris is often mobilised by alterations to the system/piping and the increased efficiency of the new boiler, and may accumulate in the boiler heat exchanger, causing noisy operation, reduced efficiency and, in extreme circumstances, failure of the boiler. 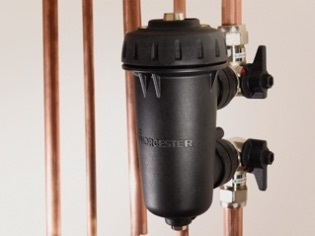 Modern boilers have smaller channels in their heat exchangers, these have been developed to minimise fuel costs and pollution,pollution, and means that they are more susceptible to problems caused by debris in the system water. A magnetic system cleaner is always a good idea when fitting a new boiler to an old system. This compliments a power flush and constantly works to keep the system water clean. Contact the office at Buxton Heating for advice on whether your system needs a power flush. ← Radiators not fully hot? Ensure they are bled and free from air.